MeUndies is a monthly subscription of fun and comfy modal underwear! Check out the March 2019 Women’s review! MeUndies is a monthly subscription of fun, comfortable, and stylish undies. Check out the Women’s review for February 2019! MeUndies is a monthly subscription of fun, comfortable, and stylish undies. Check out the Women’s review for December 2018! The MeUndies limited edition Star Wars undies collection is back! Meundies iCyber Monday Sale EXTENDED – Take up to 50% off World’s Comfiest Undies! Ends Tonight! 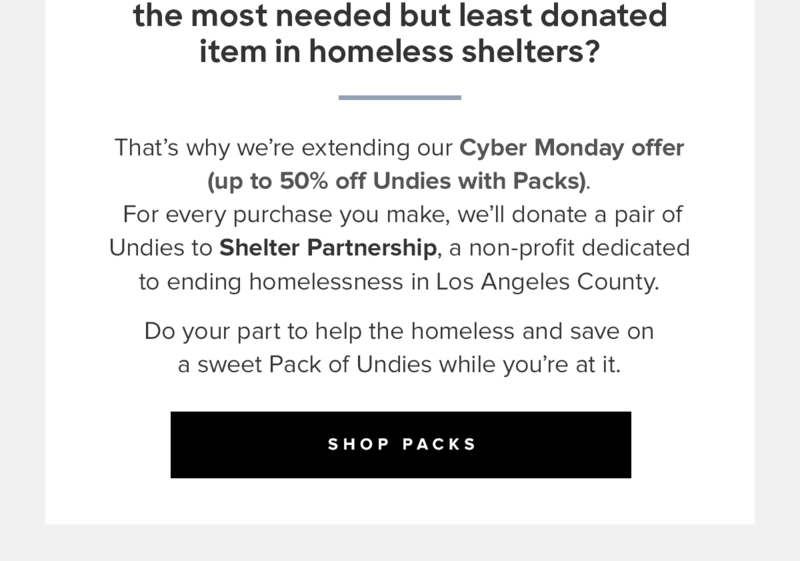 Meundies is having a Cyber Monday Sale – Take up to 50% off World’s Comfiest Undies! Save 40% On World’s Comfiest Undies: 40% on First Subscription Pair! TODAY ONLY! MeUndies is a monthly subscription of high-quality modal underwear. Check out the November 2018 Women’s review! MeUndies October 2018 featured glow-in-the-dark Star Wars-themed undies for women. See the review + grab coupon! 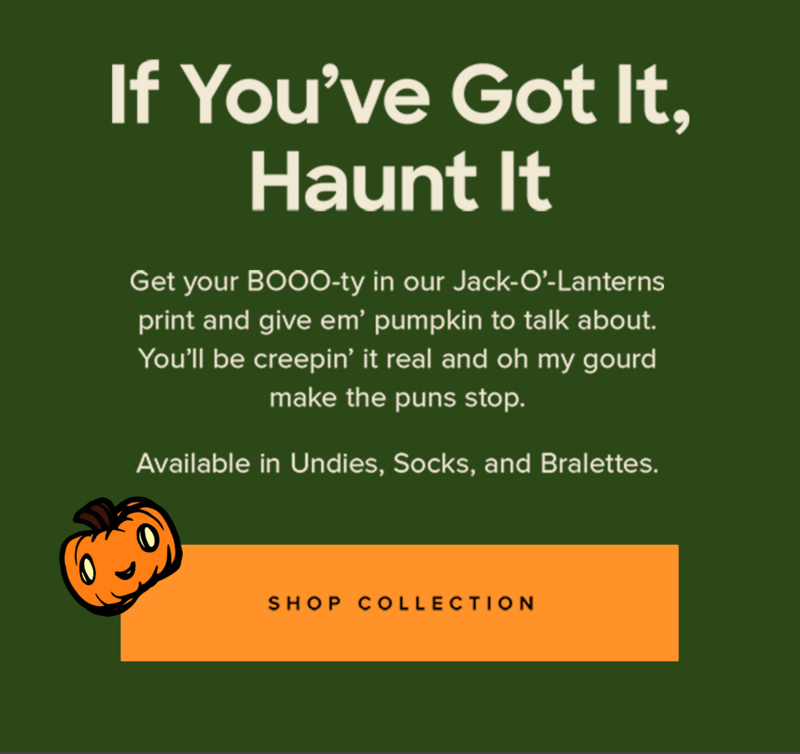 The new MeUndies Jack-O’-Lanterns collection is now available! Check out MeUndies Women September 2018 review! It features the artist Jean-Michel Basquiat! MeUndies is exclusively collaborating with Star Wars for a limited edition undies collection! See the MeUndies September 2018 spoilers – it’s a collaboration with Basquiat! Check out the MeUndies Women August 2018 review! It’s a subscription that sends modal underwear every month! MeUndies is an underwear subscription for men and women. Check out our April 2018 review + grab coupon! Meundies Tax Day Flash Sale: Get 20% off packs & subscriptions! MeUndies is a modal underwear subscription for men and women. Check out our March 2018 review + coupon code! Check out the Valetnine-themed MeUndies in February 2018 review + coupon code! Check out the leopard print MeUndies in January 2018 review + coupon code! This Valentine’s season, MeUndies is exclusively collaborating with Sugarfina, makers of the finest artisanal candies, for a limited edition candies bento box! Check out our gingebread-themed MeUndies for December 2017. Here’s the review + coupon code! Fun undies delivered to your door each month! Our November 2017 MeUndies got a little fruity and a bit loopy. Check out our review! Fun undies delivered to your door each month! Check out our review of the calavera inspired October 2017 MeUndies! Gift the world’s best undies – Spring prints in the comfiest undies around! For Men & Women in multiple styles, extended sizes, and free shipping to US & Canada! Fun undies delivered to your door each month! Check out our review of September 2017 MeUndies! Fun undies delivered to your door each month! Check out our review of August 2017 MeUndies! Fun undies delivered to your door each month! Check out our review of July 2017 MeUndies! Fun undies delivered to your door each month! Check out our review of June 2017 MeUndies!